Flint River Fresh is your “Farm Connector.” We promote access to fresh, healthy, locally-grown, seasonal food by connecting local farmers with schools, worksites, food service operations, restaurants, and directly with Southwest Georgia shoppers through our Mobile Farmer’s Market, Pop-Up Farm Stands, and Fresh Harvest Distribution Network. We are also developing another generation of young urban farmers through our Garden-To-Cafeteria, Youth Farm Stands, and Grow Your Groceries workshop. helps promote the culture and importance of local food. We envision a future where everyone in our community sources a sizable portion of the ingredients for their meals from local farmers, ranchers, and producers. 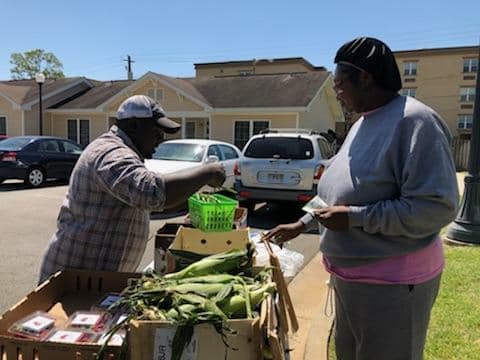 We have partnered with Albany Housing Authority to bring fresh, local, seasonal produce to their communities with a high population of seniors and people with disabilities with our Mobile Farmers Market on Wednesdays. Our Mobile Farmers Market is a "farmer's market and produce aisle on wheels." Families can purchase fresh, locally-grown fruits and vegetables from local area farmers at an affordable price through us. Our Pop-Up Farm Stands are set up in familiar gathering spaces where families can purchase locally-grown, low-cost produce from local area farmers. They are located at schools, businesses, churches, community centers, parks, conferences, and anywhere people have limited access to fresh produce or want to learn about where their food comes from. The Fresh Harvest Distribution Network connects community organizations offering nutrition program, restaurants looking to serve local produce, and schools participating in farm-to-school activities with local farmers. We work with a network of local farmers to provide fresh, locally grown fruits and vegetables year round. This provides an additional sales outlet for local farmers and encourages consumption of fresh and nutritious foods in our communities. We works with local schools to coordinate the youth farm stands for the young. A youth farm stand program is a single-vendor farm stand on or near school property that is run by the youth of that school. It is appropriately titled a “Youth Farm Stand” because often, many of the youth selling the produce have grown the produce in the school garden. A youth farm stand focuses on promoting healthy eating habits, reinforcing traditional academics, such as math and science, and building life skills such as customer service, conflict resolution and entrepreneurship. Additionally, they serve as mini–communities, modeling inclusive ways to teach the strength of diversity. The purpose of the Garden To Cafeteria program is to make a connection between the fresh produce that the students grow in the school garden to the salad bars in the cafeteria at lunch. Using food safety protocols developed with the local Health Department, students and Garden Leaders harvest fruits and vegetables weekly from the gardens, learn how to wash the large chunks of dirt off, weigh and record the amount of produce and then present the harvest to cafeteria staff. It is an introduction to organic, raised bed food gardening. Farmer Fredo will talk about picking a site, garden bed types, the value of good soil, seasonal varieties, watering, pests, harvesting, composting, and all the basics. You will learn how to go from grass to garden to groceries in storytelling, kid-friendly format. He will share his story about how he was able to harvest over 300 lbs of organic produce from a 100 sq ft garden.